TeamPages looks great on all devices. 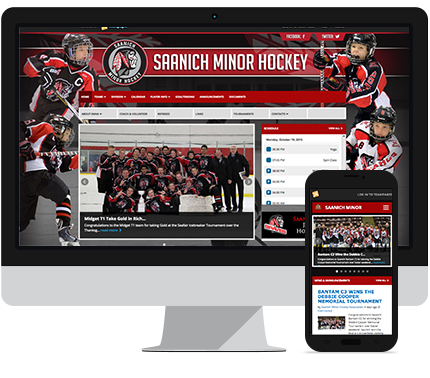 Whether you’re on an iMac or a phone - your site will look great. Choose from multiple templates, pick colours, and upload custom banner and background images. Change the layout of your website in seconds - simply drag and drop a section of your site and you’re done! Keeping your site’s content safe and secure is essential. Our intuitive privacy & permission tools give you complete control over who can view and access your site’s content. 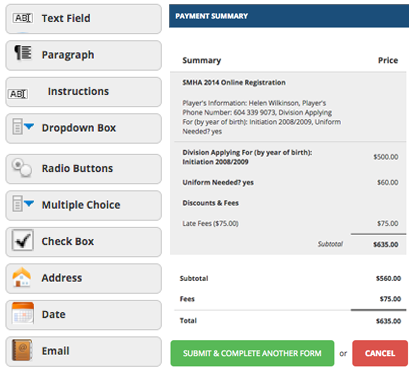 Create the forms you need without writing a single line of code. Our payment integration features allow you to easily process credit cards from your members direct from your site. Payments are processed through Paypal or other merchant accounts. Offer automatic monthly payment plans with PayPal PRO. Keep all your member data safe & secure online. Our form manager makes it easy for you to export, edit and search through all your stored information. Keep all your members in the loop about updates to events or changes to schedules. Never have team members miss another game. Use read receipts to know exactly when your messages are received. Write news and announcements easily and share them with your entire organization. Display news items in the image slider on your home page. Post the latest game scores and results in seconds. 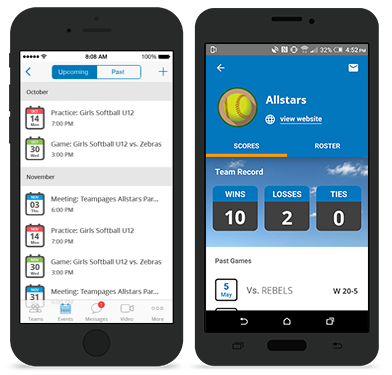 Easily track player statistics and progress throughout the entire season. Don’t let managing your team’s schedule get in the way! 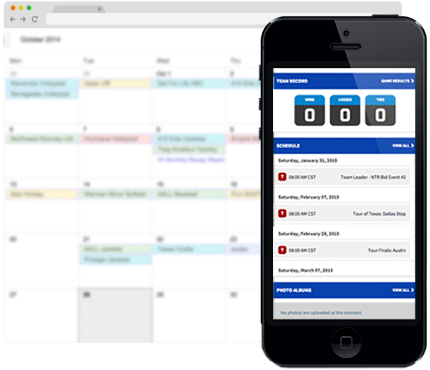 Scheduling tools to make everyone’s lives easier. 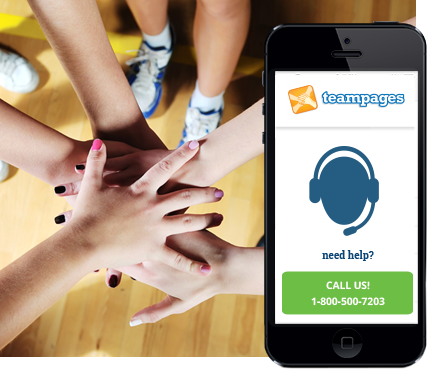 TeamPages provides a platform of easy-to-use features that let managers carry out their duties from home or on the field. 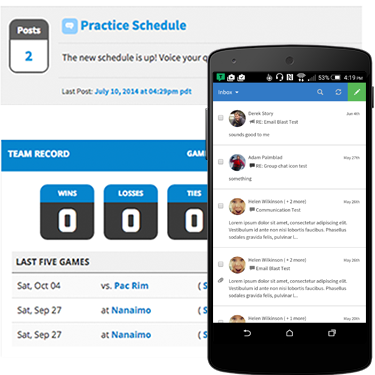 Manage your schedule and roster, send messages, get maps and directions to games and practices. Get organized and spend more time playing. Photos, videos, documents, you name it! 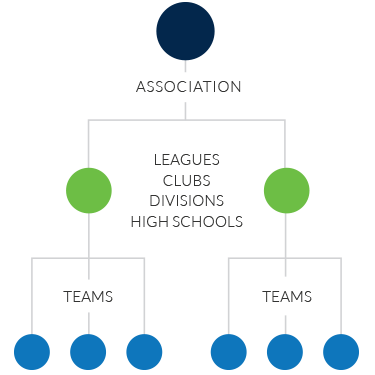 Teams can add that personal touch to every page and parents and players can look back on the great year they had with your organization. Have a question? Give one of our friendly customer support reps a call anytime at 1-888-543-7223. Whether it’s providing an online tutorial or giving suggestions for site improvements, we’re always here to help.